Were provincial officials taking part in town hall meetings on the Alberta government's plan to create a park in west central Alberta's Bighorn Country really harassed and threatened by all-terrain-vehicle (ATV) enthusiasts opposed to restrictions on their motorized activity in the environmentally sensitive Rocky Mountain Foothills between Banff and Jasper national parks? When Environment and Parks Minister Shannon Phillips announced last week that open houses in Red Deer, Sundre, Drayton Valley, and Edmonton on the proposed Bighorn Wildland Provincial Park would be cancelled after allegations of bullying at similar meetings before Christmas in Rocky Mountain House, the Opposition United Conservative Party accused her of lying and insulting rural Albertans. Phillips was the author of some of her own difficulties by saying the RCMP had an open investigation into harassment complaints. They didn't, and she swiftly corrected her statement. That was far from the "blatant lie" Rimbey-Rocky Mountain House-Sundre MLA and UCP House Leader Jason Nixon tried to make it out to be. But while Nixon argued there were no documented cases, only accusations, political bullying is not exactly unheard of in rural Alberta, in particular when it involves destructive ATV use in environmentally sensitive places. It's likely the accusations and the government's security concerns about future meetings are fully justified, despite the cynical effort by the UCP, which certainly knows better, to spin the cancelled town halls as an NDP plot to stifle broad public opposition to a plan that in reality extends well back into the Progressive Conservative era. 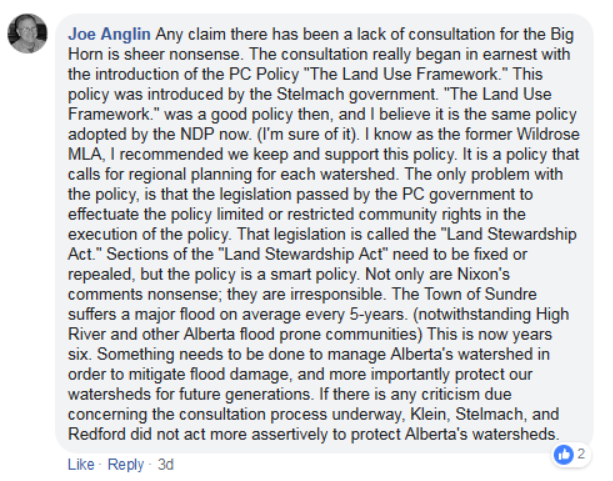 Joe Anglin, former Wildrose MLA for Rimbey-Rocky Mountain House-Sundre pushed aside by Nixon in 2015, dismissed the current MLA's position in a Facebook comment: "Any claim there has been a lack of consultation for the Big Horn is sheer nonsense," he wrote, noting that the consultation process began under the PC premiership of Ed Stelmach. "If there is any criticism due concerning the consultation process underway," Anglin continued, it should be directed at premiers Ralph Klein, Ed Stelmach, and Alison Redford for failing to "act more assertively to protect Alberta's watersheds." For its part, Postmedia's Alberta newspapers -- despite their anti-NDP editorial bias and pro-UCP headline writers -- soon established that seven government employees and one member of the public had lodged complaints about harassment, a threat and shoving at the meetings in Rocky, whether or not the RCMP investigated. Moreover, Postmedia reported, Nixon knew of at least one other complaint from a business person in the town of Nordegg -- since the news organization has a copy of that email and it was addressed to him. Others with similar experiences are now starting to come out of the woodwork. On January 12, former government employee Ken Yackimec of Lac La Biche wrote in a letter to the editor that "I can attest that this has happened and I am sure that it still does." As a public employee attempting to consult with locals on land use in Northern Alberta several years ago, he wrote, he and his colleagues "had the experience of being verbally abused by a group of ATV users for daring to even float the idea that they might not always be able to ride their ATVs where they wanted, how they wanted and to leave the place in any condition they wanted." Similarly, wildlife photographer Stephen Legault posted on Facebook on January 8 that, "while the current threats relate to the public consultation around the Bighorn Wildland, similar intimidation went on during the prolonged debate over the Castle Wildland Provincial Park." That park, in southwestern Alberta, was approved in January 2017. He described being told at a stakeholders' dinner "the last person to come around here and bully the locals got shot." Another guest "proceeded to tell me and other representatives of the conservation community -- invited guests at this event -- that we had better not mess with the Bighorn, 'or else.'" Legault continued: "I've lived here for 28 years. I've written books about the people, their culture, and our magnificent landscape. I've collaborated with and debated premiers and half a dozen Progressive Conservative Ministers of the Environment, and spent my entire adult life advocating for this wild, beautiful place. Never before have I received so many threats against my safety and my life." "The fact is, the Bighorn debate is no longer about protecting headwaters, but about the upcoming election. The UCP and the local MLA Jason Nixon have politicized this issue to the extent that it is no longer possible to untangle it from the vitriolic hatred some Albertans feel for the current NDP government and their desire to turn back the clock to a time when they could get pretty much anything they want." Noting that "the plan for managing the Bighorn is really just a modest evolution of previous plans that non-consumptive users and many consumptive users have been calling for over a number of decades," a farmer in the area told me that "it is really critical that ATV use is managed, because fish habitat and water quality is being destroyed by indiscriminate use." "When you hike out there, you can see fens (fresh water bogs) being drained by ATV tracks cut into the ground," he said. "Of course this affects creeks and fish habitat as well, not to mention the critical aquifers, which supply well water to farms and ranches hundreds of miles downstream." Because of the hysteria fanned by the UCP, he added, "public meetings have been and can be expected to be taken over by thugs and I no longer bother going, nor I suspect, do most decent people." However, he warned, replacing public meetings with online consultations is a problem too, because that opens the process "to anyone in the world, so developers who want to commercialize the whole area will have input into what is our back yard and our home place." The government will hold telephone town halls on January 15 for Drayton Valley and Sundre residents, January 16 for residents of Red Deer and its surrounding area, and January 24, for people in Edmonton. "The minister needs to make it clear this is a made-in-Alberta plan with a long pedigree that will not be derailed or changed by big capital or other carpetbaggers. She also needs to recognize that the motorized ATV crowd is hardly universally opposed to the plan." To every thing there is a season, as King Solomon said, and this sure doesn't seem like the right season for this debate. But while it may not have been wise for the NDP to pick this fight this year, they have. So why not act boldly and win it by implementing the plan immediately to protect our resource for the greater good of all Albertans? Phillips would be entirely justified to say the consultation process has gone on long enough. It has. The UCP, which has thoroughly politicized a non-partisan process for partisan reasons would howl, and threaten a battle of biblical proportions, but it's not as if the radical ATV vote is going to go to the NDP anyway. Phillips might even win some votes for the NDP among the many rural hunters, anglers, trappers, horse packers, and guides who support preserving this beautiful area and are appalled by the destructive activities of the ATV crowd. ATV users won't go away without a fight, of course. As the interview subject of an undated online article for ATV users observed of past efforts to keep access to the Bighorn unrestricted, "in about 2000, the government actually wanted to turn it into a park." That "would have eliminated a lot of users -- motorized for starters. … Whenever any of these access plans come into place, you cannot walk away. Your guard has to be up constantly." And political bullying in rural Alberta won't go away either. It's a category of rural crime that doesn't seem to bother the province's conservatives very much -- probably because it's almost always perpetrated by their own fringe.